Best blankets for eczema - Stop that itching! TOP 20 ECZEMA BLOG LIST – Raising awareness! What are the best blankets for eczema? Over the past 47 Years, I have been suffering from eczema ( Atopic Dermatitis ) and my son also has the same skin condition only much worse than me, poor thing! One thing we have learned is that eczema is harder to treat if you are tired and irritable through lack of sleep. Your body heals whilst you sleep at night, so it’s vital for managing your eczema that you get the best nights sleep possible. In this article, we will cover the Best blankets for eczema and also the best bedding for eczema and asthma/allergies. Many people who suffer from eczema also suffer from allergies or have Asthma so we thought it might be helpful to offer more solutions than just blankets for eczema. Short on time? Best prices here! Allergy-free bedding why are they a good idea for eczema sufferers? Is allergy Free bedding good for eczema sufferers? Many people including children suffer from asthma and eczema, the conditions often go hand in hand. On average 50-70% of children with eczema suffer from asthma, and 1 in 3 people have some form of allergy. A recent study carried out on genetically engineered mice identified a protein that could be part of the link between atopic dermatitis and asthma. Read the full case study. If you suffer from allergies you might notice that you wake up some mornings with a stuffy nose and hayfever type symptoms. Your pillow could be the problem, they provide the perfect habitat for dust mites. The dust mites leave their droppings on and around your pillow which contain allergen called rhinitis. It’s these allergens that give you the blocked and stuffy nose. Hypoallergenic pillows are made from materials which are themselves less likely to trigger allergies. Anti-Allergy pillows have been treated in a way that deters dust mites from living in your bedding. To be honest they both achieve the same purpose. Weighted blankets are widely known to help people suffering from ADHD & Mental health issues and anxiety. We recently wrote a full article on the topic. CLICK HERE! These blankets are filled with heavy inserts like beads or pellets to weight them down. They have a cover which can be removed and washed. The beads are lock inside the blanket and can’t come out. Weighted blankets work due to something called DPTS which stand for deep pressure touch stimulation. Pressure is exerted over the body which provides both physical and psychological benefits. It’s like a big hug! Best blankets for eczema the answer! These two options are the best bedding sheets if you suffer from eczema or any other skin condition. When buying new bedding you should look for breathable, lightweight and smooth materials. The reason your eczema itches more at night is due to the body releasing a substance called cytokines, which increase inflammation and increases body temperature making you want to itch. This plus your body produces fewer corticosteroids at night, a hormone that reduces inflammation. All this results in the urge to itch. Your skin also loses more water at night. Have a regular bathing & moisturizer routine before bed. Try taking antihistamines to help sleep better. Check out Healthline’s article on 17 Proven tips to sleep better at night. 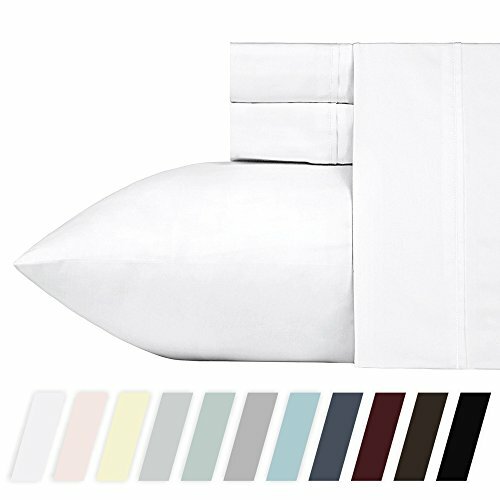 HIGHEST QUALITY BEST COTTON SHEETS New Better & Improved 2018 Version - If you love the luxury and durability of hotel bed sheets and the look of crisp pillowcases, you'll adore our Breathable Full Sheets, 400-thread-count. We use yarns made with 100% long staple cotton fiber and a gorgeous sateen weave. Our eco-friendly sheets retain softness for a lifetime and resist fading. Indulge in soft bed sheets with detailed hem styling, also available in Twin, Twin XL, Full, King and Cal King sizes. QUEEN Size Luxury 4pc Bed Sheets Set - 1 Flat Sheet: 90" x 102"; 1 Fully Elasticized Fitted Sheet: 60" x 80" + 16" finished deep pocket to fit mattresses from 9" to 18"; and 2 Standard Pillowcases: 21" x 30". Our Deep Pocket fitted sheet feature Smart Head/Foot Tag to indicate the width side of the bottom fitted sheet for ease of use. EASY HOME LAUNDRY & QUICK DRY - Highest quality dye materials are used for fade resistance. Recommended for regular wash & short dry cycles for superior softness. CERTIFIED STANDARD 100 by OEKO-TEX® - tests for harmful substances. Extensive product checks and regular company audits ensure that the industry has a globally sustainable awareness of the responsible use of chemicals. The fabric is then tested for meeting performance like no pilling, shrinkage, color fastness, tear strength and thread count authenticity before being individually measured and stitched to perfection. Then it is inspected, piece by piece, to be defect free and packed as set. LEED v4 GOLD CERTIFIED - Made Ethically in India in a certified, socially compliant and awarded factory which supports more than 300 working families. The fabric is manufactured in one of its kind Gold Rated LEED v4 Certified Facility equipped with most modern machinery. The factory is the second manufacturing facility in the World to achieve Gold LEED EBOM certification from the United States Green Building Council (USGBC). ULTIMATE ALLERGEN BARRIER: Made with PORE SIZE of just 3-4 MICRONS to effectively block bed bugs, dust mites and allergens from getting through. 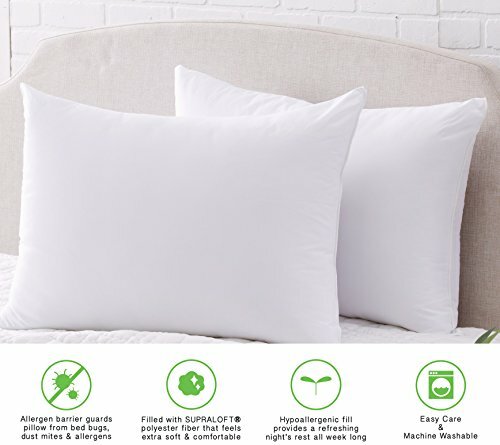 MACHINE WASHABLE: Will always have your pillow feel and look like new. Allergy Free * Machine Washable * No more annoying feathers or dry cleaning! 100% Micro-Fiber cover * Brand New & Factory Sealed in a Beautiful Zippered Gift Package. Wonderful alternative to down bedding - softer, loftier, and cleaner. Comfortable for ALL seasons! We ship UPS ground to the lower 48 states. Street address required for UPS shipment. NOTE: This item cannot be shipped to AK/HI/PR/APO/FPO/PO BOX. Thin, quiet waterproof barrier protects all six sides of the mattress from fluids and spills - vinyl free materials are safe for kids. ERGONOMICALLY DESIGNED - Highly raved by parents all around the world, our KeaBabies Toddler Pillow is ergonomically designed and tested on toddlers for the best spinal support without compromising on their comfort. DURABLE & WASHABLE - We know that mess always happens with kids around. 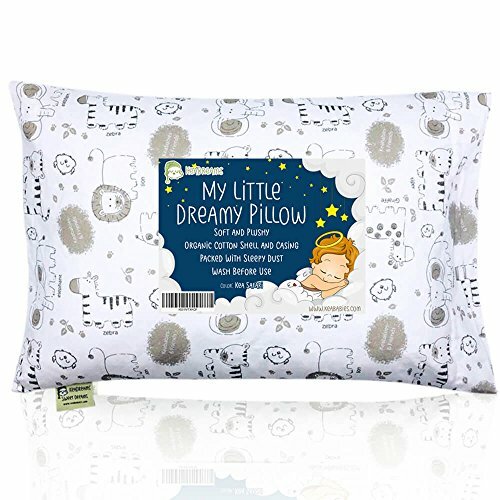 Our Toddler Pillows are machine washable for the pillowcase and pillow shell, keeping your toddler's pillow clean and fresh. 365 DAYS MANUFACTURER'S MONEY BACK GUARANTEE - We offer you a hassle free 100% FULL refund if you are unsatisfied with our product. This is how confident we are of our quality product. Absolutely NO RISK for you! Click the Add To Cart Button to get yours now! CUTE KEA SAFARI PRINT - All kids LOVE ANIMALS, our KeaBabies Toddler Pillowcase is designed with that in mind. Simple and neutral unisex pillowcase to match any toddler bed to cot setting. Match it up with our KeaBabies Blanket. PERFECT TRAVEL COMPANION - Sized perfectly for your little one to nap, sleep and play while on the go. With a pillow on hand, your toddler will feel more secured when sleeping or napping in a new environment. ❤ THE SECRET TO A GOOD NIGHT'S SLEEP: M&Y's waterproof and quilted bamboo mattress protector provides your baby with premium comfort and avoids any crinkle-like noises. Our bamboo has some amazing insulating properties. It will help your baby stay warmer in winter and cooler in summer. ❤ PROTECT YOUR BABY: Never be worried about dust mites, allergens, mold, or bacteria anymore; This mattress cover is hypoallergenic and non-toxic; It also protects from wetness, odors and household germs. ❤ RISK-FREE - 100% MONEY BACK GUARANTEE: There is no risk for you. At M&Y we design baby products of highest quality. If you experience ANY problems with your M&Y Crib Mattress Protector we refund your purchase - no questions asked. ❤ ABSORBENT, PADDED, DURABLE: Bamboo is super absorbent: often quoted as 40% more absorbent than cotton. The waterproof mattress cover with its firm padding protects your baby's mattress from any spills and leaks; Yet it's breathable and stain resistant; Built to last, this durable, high quality mattress cover withstands countless washing / drying cycles. 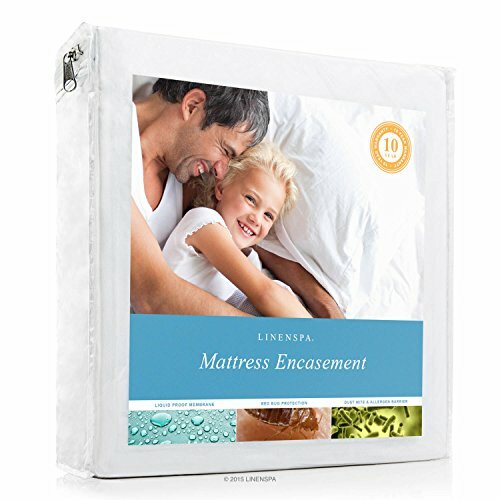 ❤ EASY CLEANING & PERFECT FIT (SIZE: 52 x 28 x 9 INCHES): Machine washable and dryable on low heat for best results; and unlike most competitor products this mattress protector will not shrink after washing and drying. 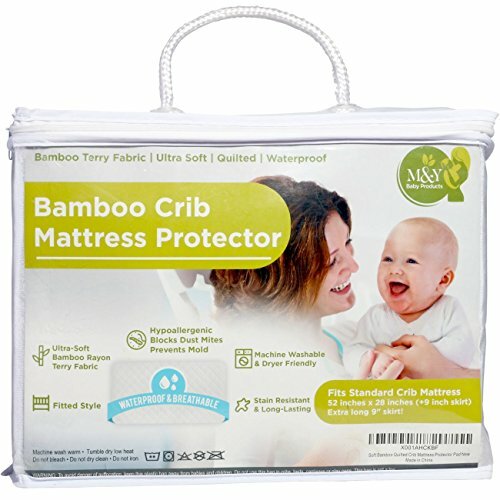 Guarantees a secure and snug fit around a standard crib mattress; Easy on and easy off; Order your M&Y Crib Mattress Protector now by clicking 'Add to Cart' on the upper right. Dealing with eczema day to day is hard, trust me I know from personal experience. Even worse is watching your son or daughter trying to sleep and itching. Then trying to deal with their lack of sleep in the morning leads to flare-ups and emotional breakdowns. Simply using cooling cotton sheets could make all the difference. Eczema loves the heat, so stay cool and reduce the urge to itch. We hope you find this article BEST BLANKETS FOR ECZEMA helpful. Please consider the Bamboo sheets as well we know lots of people using them and they highly recommend them. This website and blogs pro­vides gen­eral infor­ma­tion and dis­cus­sion about eczema, skincare, and related sub­jects. The words and other con­tent provided in this website or blog, and in any linked mate­ri­als, are not intended and should not be con­strued as med­ical advice. If the reader or any other per­son has a med­ical con­cern, he or she should con­sult with an appropriately-licensed physi­cian or other health care worker, GP or Doctor. All our affiliate links are highlighted in GREEN they will not cost you a penny more to use and we earn a small commission from AMAZON which helps us fund this website to provide useful information and support to eczema sufferers all around the world. So if you use our link, you’re helping others. So THANK YOU!